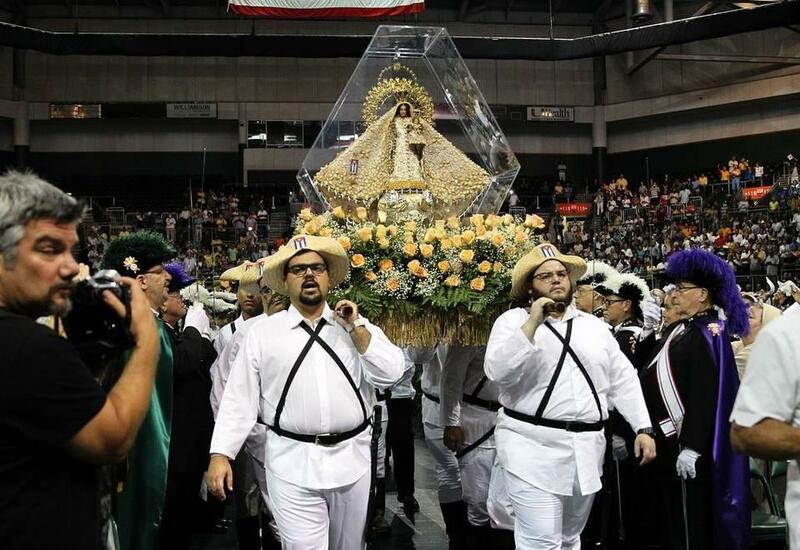 Cuban-Americans in traditional garb carry Our Lady of Charity into Bank United Center in Coral Gables this month. Pope Francis’ visit to Cuba this weekend showcases the island’s Roman Catholic recovery after half a century of communism. But that narrative is misleading. In reality, Catholicism wasn’t all that vibrant in Cuba before communism. You might not have believed that if you watched South Florida’s Cuban Catholics last week hold their annual procession for Cuba’s patron saint. Men in straw peasant sombreros carried a statue of the Virgin Mary known as Our Lady of Charity through Bank United Center in Coral Gables – a prelude to Monday, when Francis will pray at Our Lady of Charity’s actual shrine near Santiago, in southeast Cuba. La Virgen de la Caridad, as she’s called in Spanish, is supposed to symbolize the island’s Catholic roots – which Fidel Castro and his communist revolution tore out in the 1960s. Castro declared Cuba an atheist state in 1961, shutting down Catholic schools and exiling hundreds of priests. Cubans like 32-year-old Carlos Hernández heard that political dogma growing up. But in Cuba, compared to the rest of Latin America, tearing out Catholicism didn’t require a lot of effort – with or without a revolution. “If you consider attendance at religious services like Mass,” says Jorge Duany, who heads the Cuban Research Institute at Florida International University in Miami, “then Cuba was not very Catholic” even before Castro took power in 1959. That lack of real Catholic devotion in Cuba’s DNA has made it hard for popes – even one as popular as Francis – to exert influence over the Cuban government on issues like human rights. In fact, Miami Archbishop Thomas Wenski remembers that when the late Pope John Paul II visited Cuba in 1998, “the Church had to explain to a lot of Cubans just exactly what a pope was.” That wasn’t the case in John Paul’s native Poland, even under communist rule. So why has Cuba’s bond with Catholicism been so historically weak? After all, Cuba was one of the jewels of the fanatically Catholic Spanish Empire. One answer lies in the early 19th century, when Latin America won independence from Spain. Except Cuba. 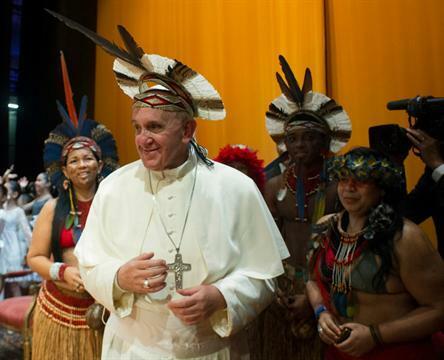 In most countries, Catholic clergy sided with the locals. But in Cuba “the Church [was] aligned with the Spanish crown,” says Sister Ondina Cortes, a Cuban-American nun and theology professor at St. Thomas University in Miami Gardens. That pro-imperial stance created a lasting mistrust of the Catholic Church among Cubans. The Church also had to compete with Afro-Cuban religions like Santería. 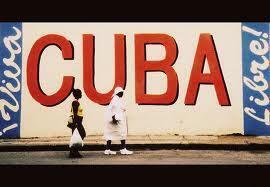 And Cuba’s Caribbean locale made it a port of call for more liberal thinking coming in from 19th-century Europe. But Cortes says Cubans who fled the 1959 revolution included a cadre of more genuinely devout Catholics emerging in Cuba at that time. Cuban leader Raul Castro, left, meets with Pope Francis at the Vatican in May. Meanwhile, in the 1990s, Cuba faced economic catastrophe – and pragmatism suddenly looked more appealing than atheism. Fidel and his brother Raúl Castro – who had both attended Catholic schools – asked the Church to help struggling Cubans. That decision to let the Church rebuild itself changed the lives of Cubans like Carlos Hernández. As a kid in Camagüey, he’d learned to reject his family’s Catholic faith. Yet as Hernández watched the Cuban church re-emerge, so did his Catholicism. Five years ago he was serving as a radiologist in Venezuela when he took asylum in Catholic churches there and defected to the U.S. with his wife and two children. Hernández now owns a cleaning company in Boynton Beach. He says for once, Catholicism is taking a real, popular hold in Cuba. And he thinks that – and the fact that Francis is the first Latin American pope – mean the Church can now influence reform there. 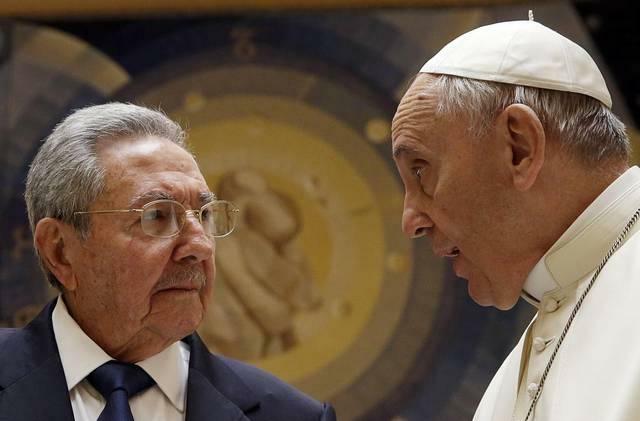 Pope Francis and Raúl Castro, who is today Cuba’s president, will meet on Sunday. The Church is still in no position to spark a Cuban Spring. But even so, it’s time to see if being more Catholic can help make Cuba more democratic. The first pope from Latin America is visiting Cuba later this month. Pope Francis will be the third pope to visit the Communist dictatorship since Pope John Paul II visited the nation in 1998. The church has done a lot of bridge-building since 1998. 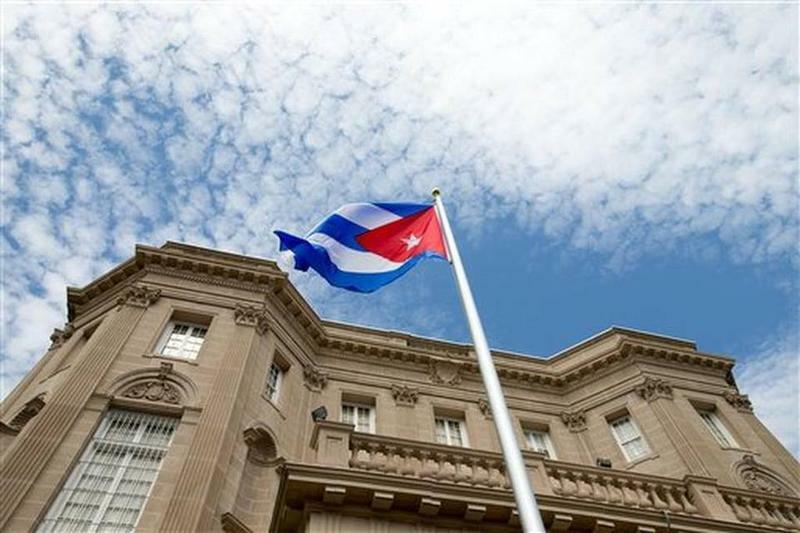 Will New Embassies Tamp Down Or Ramp Up The U.S.-Cuba Spy Game? When Cuba opened its Washington D.C. embassy yesterday, the moment wasn’t just historic. It also felt really ironic. Historic, of course, because Cuba was raising its flag over the U.S. capital for the first time in 54 years. When the U.S. inaugurates its embassy in Havana on August 14, it will be the crowning moment in the restoration of diplomatic relations between the two Cold War enemies. But this might be a déja vu moment, too, because a big reason the U.S. and Cuba severed ties in 1961 was...embassies. They say Americans will do anything for Latin America except read about it. But even gringos couldn’t ignore the noise next door in 2013. Seemingly overnight, Brazil experienced violent anti-government unrest – then just as quickly it became the spokesnation for a world outraged by the U.S. surveillance overreach exposed by Edward Snowden.